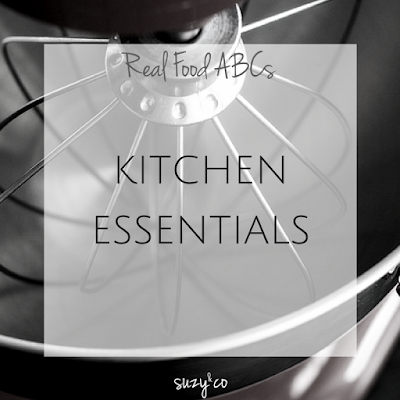 Having the right kitchen tools to cook with can help ensure you will cook and eat real food. For this real food abc, I am going to highlight some tools and equipment I think make it much easier to eat real food regularly. Crockpot - This is by far the most useful tool I have in my kitchen. I have been making extra large crockpot meals and then freezing the leftovers. The other nice thing is not worrying about cooking in the late afternoon when things seem to get hectic. Microplane zester - This little tool does so much. Obviously it is great for zesting fruit. But I also use it to mince garlic and ginger. It is great to grate Parmesan cheese. Remember all those dressing I make? This tool makes including those ingredients so much easier. And it is much easier to clean than a garlic press. Kitchenaid Mixer - I love my mixer. I have a totally retro Pistachio color. Although this is a higher priced kitchen gadget it is so worth it. I keep mine on the counter. I use it for baking and making homemade bread. I have a few accessories as well. I use it for shredding cheese, to julienne veggies. I also have the meat grinder attachment to make my own burgers. Fine Mesh Strainer - I love this strainer. It works for so many things. I rinse quinoa in it and the seeds will not fall through. I also use it to strain my yogurt to make it thicker. I have even used it to sift flour and other dry ingredients. Rice cooker - We do eat a fair amount of rice in our household, but I think I use my rice cooker to make quinoa even more than rice. I love quinoa and cooking it is so much easier in a rice cooker. I just have a small cooker right now but I am hoping to upgrade to this one some day. Freezer bags - Although I am not a big fan of plastic and I tend to save every glass jar that comes into our home, freezer bags really help me. They can be stuffed with food and then frozen flat, Then you can stack a bunch of them in the freezer. Unfortunately mason jars do not store as easy and I have broken them a few times. When you have the right tools, cooking at home is so much easier and more enjoyable. What tools are essential in your kitchen?